An investigation is to be held into an apparent cancer cluster discovered among children in west Cornwall. In the past five years, six youngsters from the Helston area - all pupils at the same school - have been diagnosed with a rare form of bone cancer. The number of cases of osteosarcoma is two or three times what would normally be expected. But the West of Cornwall Primary Care Trust says it is a coincidence. One teenager, 19-year-old Emma Callar, first became ill in 1999 and it is two years since she was diagnosed with the rare form of bone cancer. But after a long and valiant fight, doctors told her on Wednesday she has only two weeks to live. 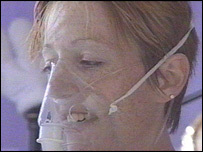 Emma's mum, Gill, said: "She has been told she has only got a couple of weeks to live, and at 19 that is very hard. "I think she held onto the fact that if she kept fighting she would keep it at bay, but it won't go. It is vicious and it keeps coming back and growing. "Now she has got nothing, and to her now, she would rather die today." Mrs Callar added: "It needs investigating. There has to be some link somewhere. "I can't believe there is that many cases from one school. "We are not going to save Emma now, but I wouldn't want anybody to go through what we are going through." The form of cancer Emma has is most common among teenagers, but there are only 30 cases of it in the UK each year. All six youngsters affected were pupils at Helston School. But in a statement, West Cornwall's public health department said that did not necessarily mean they were linked. 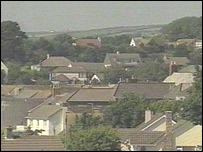 It said not all the children lived in Helston and they were diagnosed at different times. It suggested the cases were likely to have occurred by chance and that, because of the small number involved, the increase appeared dramatic. Dr Julia Verne, of the South West Cancer Registry in Bristol, said they would hold an investigation into whether the cancer cases were linked. But she said: "At the moment parents in Cornwall should not be alarmed at all. "We have been made aware of these cases and we are constantly monitoring and surveying patterns of cancer across the region. "Because there is local concern, we are going to undertake a special investigation to try and establish whether this number of cases is statistically significantly raised, and if so, whether there is any reason for it." "After a long and valiant fight, doctors say there is no more they can do for Emma"